In the end, it was no contest. Fabian Cancellara proved yet again that he is the world’s greatest time triallist with a stunning victory in the World Championships in which he finished one minute and 27 seconds ahead of the rest of the field. Second was Gustav Larsson of Sweden, third Germany’s Tony Martin, with Britain’s Bradley Wiggins outside the top 20. 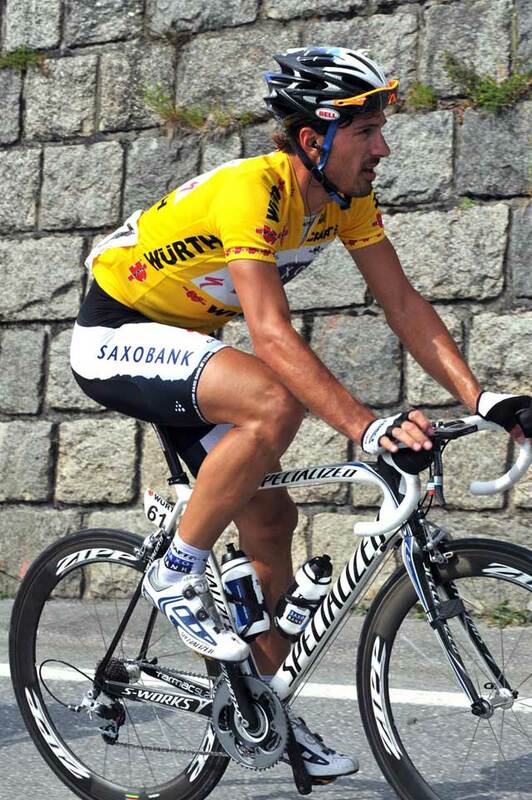 Cancellara’s performance was more than memorable. Each corner was taken perfectly, his rhythm never faltered. 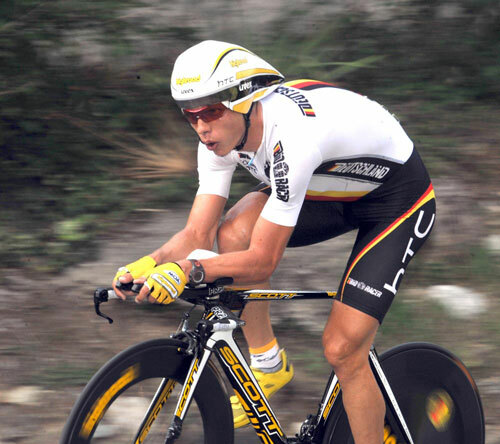 The Swiss rider passed no less than three riders en route to his third World Championships Time Trial title in five years. Victorious in the Tour and Vuelta prologues this season, and the Tour of Switzerland, taking a win on the World’s first visit to Switzerland since 1996 was almost an obligation for Cancellara. But he more than lived up to expections. Even half way through the first lap, after just 9.16 kilometres, Cancellara was 18 seconds up on second fastest Tony Martin of Germany with Marco Pinotti another four seconds down. By the end of the first lap , with an advantage of 38 seconds on Martin, the only thing that could stop Cancellara was a crash or major mechanical. Instead Cancellara powered onwards, with Swiss flags and banners waving from all sides in the warm afternoon sunshine in anticipation of a huge popular victory. He passed Larsson at the start of the second lap, Wiggins mid-way through and Belgium’s Sebastien Rosseler at the end. Finally with 200 metres to go and the gold medal comfortably in the bag, the victory salutes began. Waving his right arm in the air, pointing again and again at the Swiss national colours on his chest, this was arguably the greatest of many great wins for the 28-year-old from Berne. 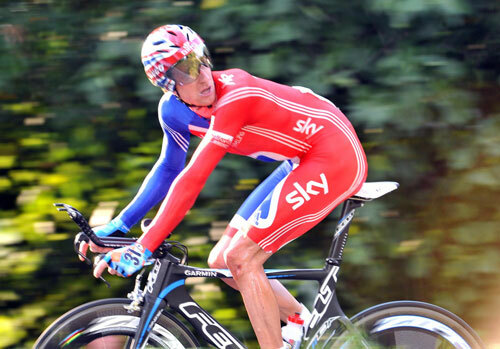 If Cancellara was able to celebrate a great win, for Wiggins this was a time trial he will surely prefer to forget. The Londoner began reasonably enough, clocking sixth fastest at the end of the first 16.6 kilometre and just eight seconds outside the provisional medals. Cancellara was un-reachable but silver or bronze was still very possible. But even if Cancellara passing him must have been expected, Wiggins race ended in disaster when he had a mechanical problem on the middle of the third lap. Throwing his bike down in frustration, with the GB team car delayed with the replacement, the Briton finally continued but the damage had been more than done. At the point of his mechanical, Wiggins was only four seconds off a medal spot. 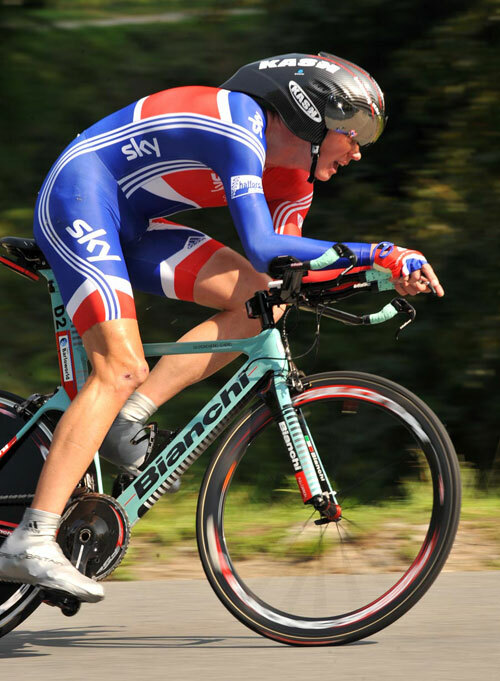 Britain’s Chris Froome put in a solid ride to finish 18th.